The California Society of Printmakers is a non-profit arts organization which promotes the appreciation of prints and printmaking. In support of this goal, the Society sponsors exhibitions on a local, and national level, carries out educational activities, and publishes an academically-oriented magazine. Although the majority of our members live and work in California, membership extends throughout the world. Kala Art Institute's mission is to help artists sustain their creative efforts over time through its Artists in Residence and Fellowship Programs, and to increase appreciation of this work through exhibitions, public programming and educational efforts. The aim of the Frans Masereel Centre is to bring the public into contact with every aspect of the printed image by means of talks, workshops, demonstrations, etc. Contacts and the exchange of ideas are essential to the always positive evaluation of the centre, which is visited annually by more than 100 artists, both young and established. Since 1986 Crown Point Press has been located in San Francisco, where it has a gallery open to the public and two large etching studios. 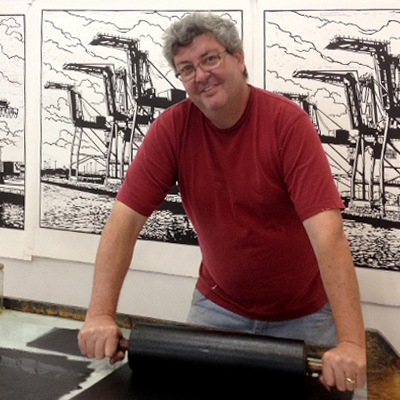 With a staff of twelve, the press currently publishes etchings by five or six invited artists a year. It also holds summer workshops open to all artists. Members of the Achenbach Graphic Arts Council (AGAC) share an interest in prints, drawings, photographs, and other works of art on paper. The Achenbach Foundation for Graphic Arts (AFGA) and its world-renowned collection is housed in the Legion of Honor Museum in San Francisco. Tamarind Institute is a center for fine art lithography that trains master printers, engages in teaching and research, and houses a professional collaborative studio for artists. Tamarind is recognized internationally for its contributions to the growth of contemporary printmaking around the world. New Grounds Print Studio is dedicated to providing artists with a professional, informative, safer and well-equipped environment for the creation of fine prints while offering opportunities to promote the artists and exhibit their work. I am currently represented by Market Street Gallery in San Francisco, CA. Stop in to see some of my new paintings as well as a selection of my etchings and other prints. Between Van Ness and Franlin Sts. Occasionally closed mid-day, call first. Arteaser.com, published by Dormain Geyer of San Francisco CA, provides original interviews with local artists. Arteaser is a unique venue for art lovers to discover local artists featuring interviews, commentary on recent art events and an up-to-date calendar of local events. Arteaser interviews provide written introductions to artists that include personal histories and illuminating insights into their artwork and personal work habits. This is the streaming video of an interview with Arthur Bruzonne of San Francisco Unscripted, a television interview show that features local luminaries discussing topics of interest to Bay Area viewers. On the Comcast television network. If you are interested in hearing me speak about my artwork and the Bay Area arts scene, click on the title above. The interview is approximately fifteen minutes. Recorded in December, 2007.